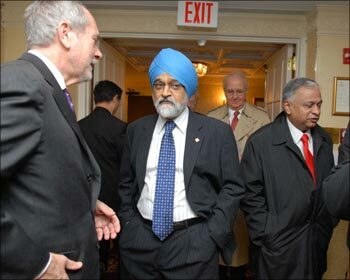 As it becomes ever-apparent that partnerships like the United States and India will help provide a roadmap out of the current global recession, influence the economic destiny of the 21st century, and create jobs around the world, over 500 America's business leaders converged on the US Chamber of Commerce to greet Prime Minister Manmohan Singh for his first major address in Washington DC on November 23. "This decade marks a major step forward in U.S.-India relations," said Thomas J Donohue, president and CEO of the US Chamber, while introducing the prime minister at the event. The prime minister emphasised that the Indo-US strategic relationship had to be underpinned by a strong economic relationship to prosper. It is a pleasure to be visiting Washington DC again. I am looking forward to my discussions with President Obama tomorrow, when my official programme begins. Today, however, belongs to the private sector and I am delighted to have this opportunity to address this select gathering of distinguished business leaders. Ladies and gentlemen, in today's economically integrated world, economic relationships are the bedrock on which social, cultural and political relationships are built. Click on NEXT to read on further. . . 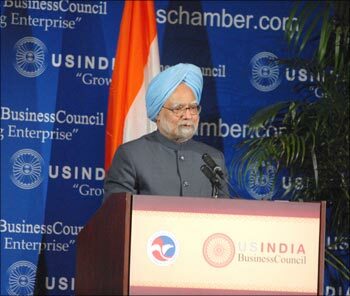 Image: US Chamber and US-India Business Council join industry leaders in welcoming Prime Minister Singh at the USIBC event in Washington DC on November 23. A strategic relationship that is not underpinned by a strong economic relationship is unlikely to prosper. On the other hand, a web of economic relationships intensifies both business-to-business and people to people contacts, promoting a deeper and better understanding between countries. That is the kind of relationship we want with the United States. Ladies and gentlemen, India's new and evolving relationship with the United States is in many ways the natural consequence of changes in economic policies and business practices that have occurred as countries have responded to the process of global economic integration. India's policies also changed in the process making our economy much more open to trade and investment, and more closely integrated with the world economy. These policies have yielded visible benefits for India. In the five years before the global crisis of 2008, India's economy grew at an unprecedented rate of 9 per cent per year on average. India began to be perceived as one of the fast growing emerging market economies. It became an attractive destination for foreign investment. I am happy to say that American business has been part of India's economic transformation. Most of the large American corporations are now present in India as foreign direct investors. 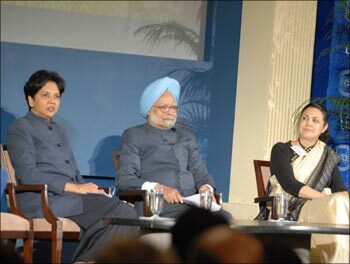 Image: PepsiCo chairman and USIBC president Indra Nooyi, Prime Minister Manmohan Singh, and Indian Ambassador to the United States Meera Shankar at the USIBC event in Washington DC. Many are engaged in high technology work, with their Indian operations forming part of their global supply chains. US business in India has also groomed managerial and technical talent which they have liberally used for their global operations. A number of companies have located research facilities in India attracted by the availability of high quality scientific talent at relatively competitive costs. In recent years Indian companies in sectors ranging from auto components, tractors, pharmaceuticals and software have also been investing in the United States and creating thousands of jobs in this country. This two-way flow illustrates the mutually beneficial nature of our relationship. Ladies and gentlemen, our engagement with the US has been expanding on many fronts, throwing up new business opportunities. The nuclear agreement was a landmark in Indo-US relations and I would like to acknowledge with deep appreciation, the very supportive role American business played in persuading Congress to support the initiative. 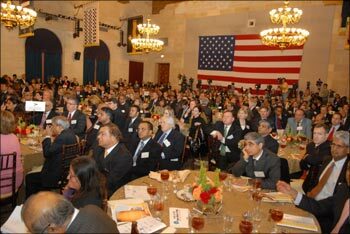 Image: A section of the American CEOs at the US-India Business Council event in Washington DC listening to Prime Minister Manmohan Singh on November 23. We are currently finalising the details that will make the agreement fully operational. Once that is done, it will remove restrictions on the flow of technology in nuclear and many other areas. This will open a large area of commercial opportunities for US business. We have an expanding area of defence collaboration including the possibility of procurement of defence equipment from the US. Our domestic private sector defence suppliers are now allowed to have up to 26 per cent foreign investment, opening a new avenue for Indo-US collaboration. As we work with other countries to meet the challenge of climate change, we are also addressing the problem domestically through a National Action Plan for Climate Change, which outlines many new initiatives in energy efficiency, and clean energy. These are areas where your companies are leaders in the field, and we should explore possible areas of cooperation. We plan to sign with the US Government tomorrow a Memorandum of Understanding on Energy Security, Clean Energy and Climate Change. This will provide a framework for pursuing bilateral cooperation in specific areas. 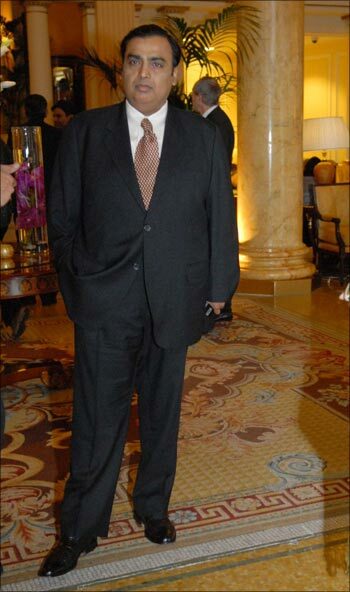 Image: Reliance Industries chairman Mukesh Ambani at USIBC. Ladies and gentlemen, as you very well know, the last year has not been an easy one for the global economy. The world has been through an unprecedented financial and economic crisis which has only now shown signs of moderating. There are two fallouts of the crisis that have implications for Indo-US relations. The first arises from the recognition that managing a highly integrated global economy requires coordinated, collective action on a global scale. After the Pittsburgh Summit, the G-20 has become the premier forum for international consultation. As members of this group, our two countries will have the opportunity to cooperate in addressing all the critical issues facing the world economy. The second is the recognition that the large dynamic emerging market economies are now significant players in the global economy. They are expected to grow faster than the industrialised countries in the years ahead. This will gradually increase their share in the world economy and also increase their contribution to global growth. 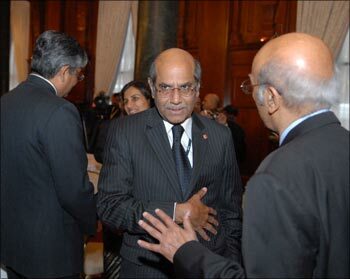 Image: Shyam Saran, special envoy to the prime minister on climate change, at USIBC event in Washington. India is the second largest of the dynamic emerging economies. Like other emerging market economies, we too have been affected by the crisis of 2008. Our growth rate has decelerated to 6.7 per cent in 2008-09 and will remain at around 6.5 per cent in the current year. However, we expect to accelerate from this level and get back to a growth of around 9 per cent within two years. There are a number of reasons why I believe the Indian economy will resume rapid growth despite the fact that slower growth in industrialised countries will limit our export possibilities. Our domestic savings rate has increased very substantially and supported an investment rate of 39 per cent in 2007-08, most of it being in private investment. We have ample human resources in terms of labour skills, scientific talent, and management capability. Looking ahead we enjoy a demographic dividend in terms of a growing working age populations in a world that is aging rapidly. We have a vibrant and innovative private sector, which operates independently of government. Rapid and inclusive growth in the years ahead will enable us to achieve our social objectives. It will also result in a few hundred million people entering the Indian market for a wide range of consumer goods. 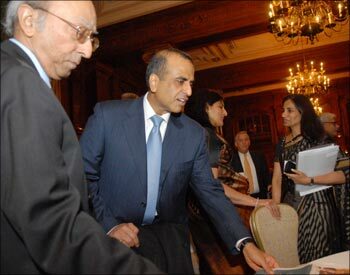 Image: Former CII secretary general Tarun Das (left), Bharti Airtel chairman Sunil Mittal (center), and ICICI Bank CEO Chanda Kochchar (right) at the USIBC event in Washington DC. American companies interested in global markets would be well advised to look at India. Ladies and gentlemen, a major weakness that limits our growth possibilities is inadequacy of hard infrastructure. We need massive investment in energy, transport and urban infrastructure to be able to support a high rate of growth. Expanded investment in these areas will help offset weak export demand by providing a domestic demand impetus to support higher growth. We have taken a number of steps to improve our processes of project approval and implementation. I invite American business to look at the large number of public private partnership projects in infrastructure being promoted by the central government and individual state governments in India. We would welcome innovative ideas to finance such public private partnerships. Ladies and gentlemen, American business is also welcome to invest in other areas. These include agriculture based businesses such in the post harvest segment including cold chains, agricultural marketing and food processing; manufacturing and mining; and of course services such as financial services, retailing and tourism. Ladies and gentlemen, wherever I meet businessmen to talk of our plans for the future, the question I am most often asked is whether economic reforms will continue. You should have no doubt on that score. The economic reforms of the past have brought us advantages and I can assure you that we will continue down the road. We might do it gradually, and in a manner which builds a consensus for change. But I assure you we will persevere. We plan to push ahead on key reforms in several areas especially those aimed at bringing the deficit under control while ensuring a strong expansion in investment in infrastructure. Tax reforms, especially the introduction of a Goods and Services Tax, are a very important part of the agenda. So also are financial sector reforms. We are also committed to major reforms in education and skill development. We have started a programme to raise resources by sale of equity in public sector enterprises. Legal reforms aimed at reducing delays are another priority. Ladies and gentlemen, both our governments attach a high importance to the role of the private sector. President Obama and I have reconstituted the Indo-US CEOs' Forum, with Mr David Cote and Mr Ratan Tata as co-chairs. The forum will provide a platform where representatives of our private sectors can submit joint recommendations to the two governments on ways of enhancing private sector cooperation between our countries. I look forward to the recommendations emerging from this group. Ladies and gentlemen, American business has played a vital role in transforming the Indo-US relationship into what can today be called a strategic partnership between the world's oldest democracy and the world's largest. I thank all those here who have contributed to this process. I invite you to stay engaged as we transform India from a low income country into a vibrant market of over a billion people, with steadily growing purchasing power. Image: Ajay Shankar (Ambassador Meera Shankar's husband) and Samir Brahmachari signing an Mou with US representative at the USIBC event.